A partial lunar eclipse will take place on August 7th (or 8th), 2017, the second of two lunar eclipses in 2017. The Moon will only be slightly covered by the Earth’s umbral shadow at maximum eclipse. 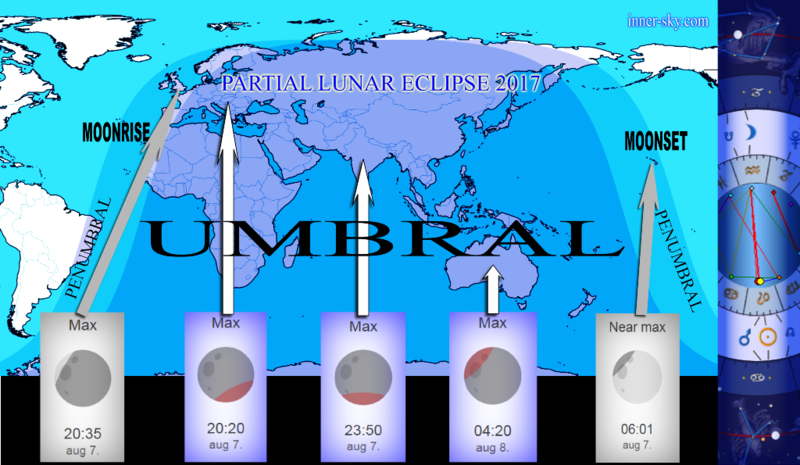 See zoomable chart showing the geographic regions of eclipse visibility. During this eclipse, the Moon will be in the constellation Capricornus, sidereal Capricorn and tropical Aquarius. (Partially) eclipsed Moon indicates (partially) affflicted status of lunar energies, but, of course, it suggests some mental or concrete ’restoring’ actions depending on the actual qualities of the given celestial context . The occult influence of this actual eclipse may hit mostly those who have a natal Moon near the 16th degree of tropical Aquarius, or have any planets (in their birth chart) ’somewhere nearby’ with any disharmonic aspects to their natal Moon.